At age of three, Darrell, a handsome brown skinned boy, was diagnosed with ADHD. Now, a 15 year-old freshman with family problems he was sent to live with his grandma. Just a month into his freshman year of high school he was in a new neighborhood and school without an Individual Education Plan (IEP) or medication. The school year was already underway with students and teachers in the flow of the daily curriculum, seating charts, locker assignments and friendship. Kids face a host of issues entering school midstream, but it’s particularly difficult when, like Darrell, they have unaddressed invisible disabilities. Darrell was left on his own to find ways to connect academically and socially. In the classroom he was unable to follow the lessons and decided to put his efforts into developing friendships. His attempts were misguided and ended with a fight with a boyfriend of a girl he “friended.” As his teacher publicly berated him, Darrell put his head down and mumbled, “Clown.” For this one word, security was called (off-duty Chicago Police Officers). Without a behavior plan in place, or any protections, Darrell was threatened, arrested and ended up pleading guilty in order to avoid court. And, so it goes for so many black males with disabilities – zero tolerance and the school to prison pipeline. According to MacArthur Foundation’s broad-based Juvenile Justice initiative called Models for Change, the estimated percentage of youth in the juvenile justice system with disabilities ranges from 30% to 70% (the wide variation reflects improper tracking and assessment across the system). When compared to the 12% of youth with services through their school, even the most conservative estimate reflects an alarming overrepresentation of kids with disabilities in the system. In 2010, 27,563 youth arrests were made in Chicago (about 1/5 were arrested through CPS). 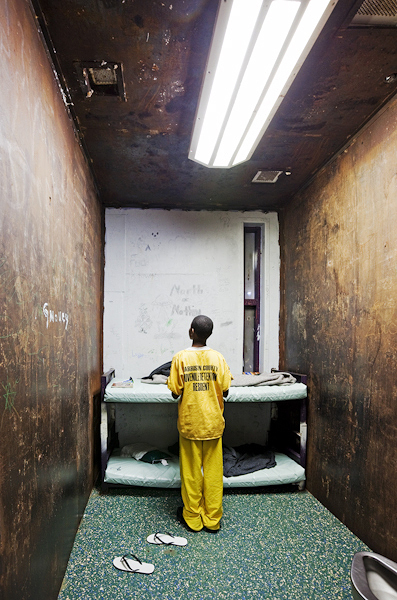 In hard numbers, in Chicago, between 8300 and 19,000 arrests in 2010 were “youth with disabilities” arrests. One week before I met Darrell in Juvenile Diversion, Eric Holder and Arne Duncan released, “A Resource Guide for Improving School Climate and Discipline,“ in which they state that it’s important, “for schools to recognize that any arrests or referrals to law enforcement can have negative collateral consequences for students, and that students of color and students with disabilities may experience disproportionate contact with law enforcement and the justice system.” Darrell, along with thousands of other black and brown youth, was one more exclamation point on the Holder/Duncan statement.